The Cam board is smaller and has 67 squares. Each side in Cam has two Knights and five Men. Each side in Camelot has four Knights and ten Men. The object of Cam is to get one piece into the opponent's Castle. 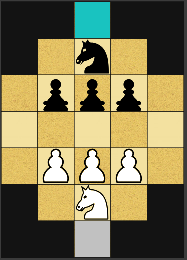 Victory in Cam also occurs if one side, even with only one remaining piece, captures all of the opposing pieces. Stalemate in Cam is impossible. The Camette board is smaller and has 23 squares. Each side in Cam has 1 Knight and 3 Men. Each side in Camelot has four Knights and ten Men. The object of Camelot is to get one piece into the opponent's Castle. Victory in Camelot also occurs if one side, even with only one remaining piece, captures all of the opposing pieces. Stalemate in Camelot is impossible. The Chivalry board has 176 squares. 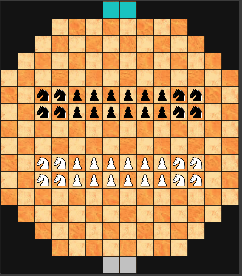 The Camelot board has 160 squares. Each side in Chivalry has eight Knights and twelve Men. Each side in Camelot has four Knights and ten Men.